Tangy Cranberry with Thyme Vinaigrette - Our Sunday Cafe, the Retirement Edition! Salad dressing is one area I have wanted to take control of in the kitchen. While I love the convenience of a purchased bottle of dressing, it is expensive and honestly has ingredients I don't cook with in my own home. The solution is to keep a couple of different kinds of homemade salad dressing in our refrigerator. This is just as convenient as store bought, but made with ingredients we prefer. Cranberry with Thyme Vinaigrette with Feta over mixed greens. I have been a lover of creamy blue cheese dressing my whole life and I could go on eating that as my only salad dressing for the rest of my life. But I don't always have a wedge of blue cheese in the fridge and the time has come to branch out. I actually started making homemade salad dressing a few years ago, but now in our new home, it is the only way to go. I will always love a creamy blue cheese dressing, but I have been pleasantly surprised at how much I enjoy a good vinaigrette. Chop cranberries until finely minced. Combine minced cranberries water vinegar honey and thyme. Bring to a boil, cover, set aside to cool. Combine cooled cranberries with remaining ingredients in a screw-top jar or other tight lidded container, shake well before serving. Refrigerate leftovers. 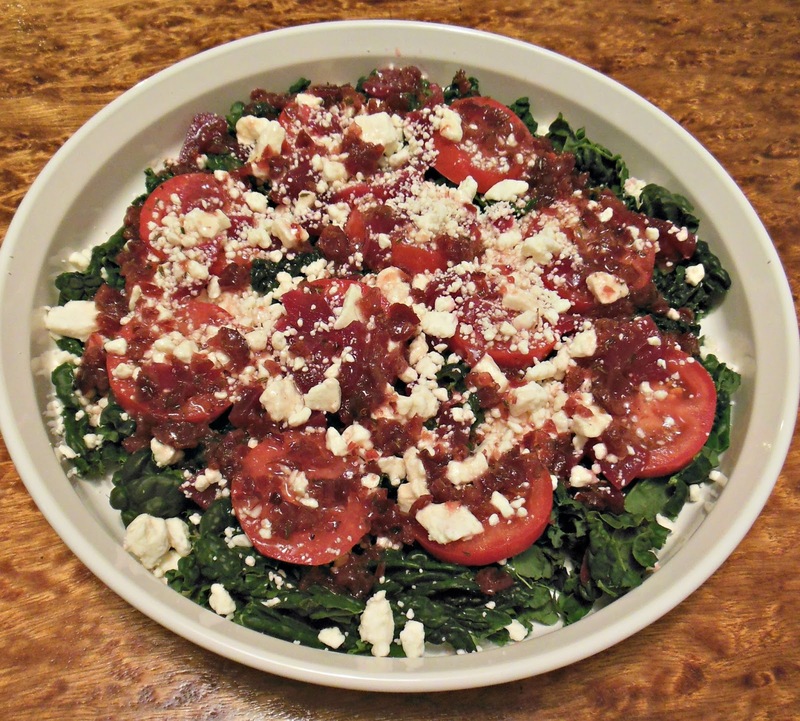 Kale, Romaine, and Spinach with Tangy Cranberry and Thyme Vinaigrette. Our winter salad greens have become a delicious medley of Tuscan Kale, Romaine, and Baby Spinach. The Tuscan Kale was a wonderful surprise, it is tender and delicious in a tossed salad. The more we experiment with various leafy vegetables in place of salad greens, the more we enjoy a salad. That dressing got me, perfect to counter a heavy meal. I make my own as well, and have for years, usually a vinaigrette of some sort. I have come to enjoy vinaigrette here lately. So much lighter in flavor than a creamy dressing, and I have been inspired by our local cranberry harvest. Thanks for stopping by! The dressing sounds delicious -- cranberries are always so festive this time of year, too. Thank you! Thank you, glad you stopped by! I agree, this dressing seems to say fall! You can tell with all my cranberry recipes here of late, I have been influenced by our harvest on the peninsula. This is in our regular rotation for salad dressings. Thanks for visiting. I just pinned this recipe, your salad looks so tempting. Hi, let me know how the fresh version works out. Thanks for visiting. Love the new look of your site, Melynda! It looks wonderful! Your Vinaigrette sounds fantastic - love the holiday flavours with the cranberries. Scheduled to share on our Hearth and Soul Facebook page. Thank you for sharing with us.